What makes an Amish Dining Chair different from all the rest? The construction, the quality, the comfort and the style, just to name a few things! This solid wood Amish Dining Chair shows off your choice of solid wood with slender vertical slats topped with an impressive straight top chair rail design. Surround your table with rich solid wood seating that keeps family and friends comfortable for hours. Wood dining chairs like these will last. They are crafted by hand in Ohio by Amish woodworkers. From the scoop in the seat to the curve of the arms, each detail is given maximum attention. American Made in Ohio, these Amish Dining Chairs come with custom options, making them just right to match your home decor. 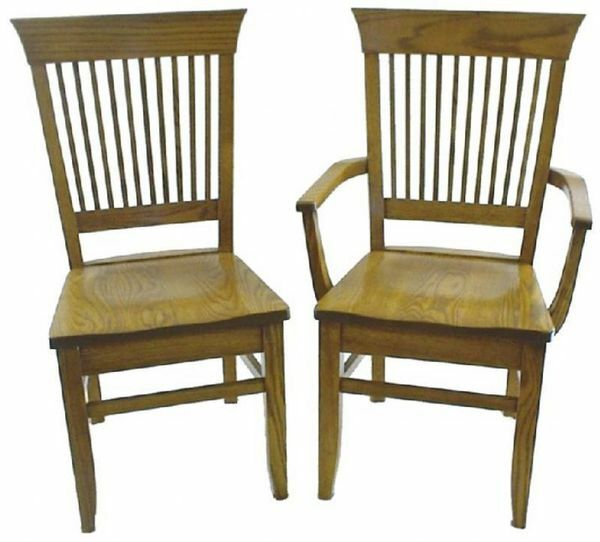 Please email or call an Amish Furniture Specialist with any questions about our dining room chairs or any of our Amish Furniture. We are happy to help you. Thank you for shopping with DutchCrafters.